Tiramisu…A Special Occasion Dessert. Tiramisu translates to pick me up, pull me up, or make me happy and that it does. Italy’s best known dessert seems to make everyone happy. This delectable creamy and indulgent dessert with a slight taste of coffee can be found not only in Italian restaurants but restaurants around the world. But don’t wait to go out to have tiramisu…make this simple dessert at home. You might think that this luscious Italian dolce has been made for hundreds of years but you would be wrong. It is a relatively new dessert from the 1970’s that most people attribute to the restaurant Le Beccherie in the Veneto town of Treviso that is northwest of Venice. I remember exactly where I had my first taste of this wonderful treat. My husband and I found a small restaurant called Orso d’Oro in Venice. It was not your average overpriced tourist restaurant but a beautiful trattoria serving delicious food. We returned one year with my husband’s mother and asked if it was possible to just have dessert and espresso as we had already eaten. We were told that would not possible but when I said that I wanted my mother-in-law to experience the best tiramisu in all of Venice, they smiled and quickly sat us at a lovely table. Seeing how this is such a popular dessert, you might be wondering why I said it was a special occasion dessert. I’m celebrating my second anniversary of blogging and wanted to share a recipe for this memorable dessert with all my readers as a way of thanking you for your friendship and loyalty. There are three simple steps to preparing tiramisu. To prepare the espresso cookie dip, mix 1 c. espresso, 3 Tbsp. Marsala wine (you can also use Kahlua, Amaretto, sherry, rum, etc.) and 2 tsp. sugar together and let cool. Have 2 packages (7 oz.) each of Savoiardi cookies (crisp Italian ladyfingers) ready for later use. To prepare the Zabaglione/Mascarpone cream you will need 4 egg yolks, 1/2 c. sugar, and 1/2 c. Marsala wine. You will also need a 16 oz. container of Mascarpone cheese, and 1 c. heavy whipping cream. In a large heatproof bowl, whisk the egg yolks until they are a little fluffy, then slowly add in the sugar, whisking until combined, then whisk in the wine. Place the bowl over a pot of simmering water (do not let the bowl touch the water) and whisk the egg mixture constantly for about 10 minutes until it has thicken and has almost tripled in volume. Remove from the heat and continue to whisk for several minutes more until the cream is thick and a light lemony color. Let cool for several minutes then add the mascarpone. Whisk until the mixture is completely smooth. In a separate bowl, whip the heavy cream until it forms stiff peaks. Then gently fold the whipped cream into the zabaglione/mascarpone cream a little at a time until blended. To assemble the tiramisu: You can use a 8″ x 8″, a 7″ x 11″, or a 8 1/2″ x 4 1/2″ pan or a trifle bowl. You can even use small bowls or martini glasses for individual servings…the procedure will be the same. *You will get two or three layers, depending on the size of your container so adjust the procedure accordingly. Dip the ladyfingers, one at a time, very briefly (1 second) into the espresso mixture and make one layer in the bottom of your container. Place 1/3 of the cream mixture on top. Repeat two more times. Cover with plastic wrap and refrigerate at least 4 hours, preferably overnight for the tiramisu to firm up and the flavors to combine. Remover 30 minutes before serving and dust with 2 Tbsp. dark cocoa powder. I had enough ladyfingers and cream to make two separate dishes from this recipe. I made the first one in a 8 1/2″ x 4 1/2″ loaf pan. I prepared the traditional tiramisu with three layers of cookies and cream then dusted it with cocoa powder. The second tiramisu was not traditional but was made to celebrate two years of blogging. I used an individual 4 inch springform pan. After removing the tiramisu from the pan, I used soft ladyfingers to wrap around the dessert and tied them in place with a ribbon. I then decorated the tiramisu with candied flowers instead of dusting it with cocoa. I want to take this opportunity to thank each person that stops by to visit my blog. Many of you leave comments that I enjoy reading. I appreciate your kind words and friendship that you have shown these last two years. I hope you will enjoy this tiramisu as it is a special occasion dessert for each of my loyal readers as a special “thank you”. This entry was posted in Uncategorized and tagged anniversary, candied flowers, dessert, food, Italian food, photography, Recipes, tiramisu, zabaglione. Bookmark the permalink. My wife’s favourite. That’s the prettiest I have seen. The candied fowers are amazing! Thank you John, for your lovely compliment. I think that tiramisu is a favorite of many…I know I love it. Happy Anniversary … and thank YOU for adding pleasure to our lives via your blog. I too love tiramisu … but I don’t beat the eggs over a hot bowl — and to be honest, this is the first time I’ve heard of this. Do you do this to ‘pasteurize’ the eggs or for any reason of food hygiene (raw egg and all that)? Thank you Jo, for your kind words…I’m happy to know that you enjoy my blog. Yes, I prepare the zabaglione for this recipe over simmering water for food hygiene. I know that many people don’t want to eat food that has raw egg in it and this recipe eliminates raw egg. If you are comfortable using raw eggs as many people are, this recipe can be prepared without heating the yolks over simmering water. You can also whip the egg whites and use them instead of cream. That looks beautiful! I never have the patience to candy flowers, thought with all the lilac around at the moment I am tempted. Thank you Lacey, for your nice compliment. Lilacs would be wonderful candied. Hi Tanya, I’m happy that you liked my presentation. It is so nice that you have fresh eggs from your own hens…this is the prefect dessert for them. Karen, this dessert is so lovely it would be hard to cut it to eat! The candied flowers are truly special and I love that you used a spring form pan and the extra ladyfingers for the outside to make it easier to access the dessert–sometime that first piece is a mess to get out of a square pan! Bravo! What a lovely presentation of a truly delicious dessert. Your candied flowers are the perfect finishing touch. Happy second blog anniversary. I look forward to your future posts. Thank you Bonnie, for your nice compliment and wish. I’m happy that you liked my use of the candied flowers to finish the tiramisu. I must say that your tiramisu was one of the most beautiful culinary creations I have ever seen. Perfection in every way……….delightful. Thank you for your wish, Lisa…the two years went by so fast. I’m happy that you like the recipe for the tiramisu. Beautiful dessert! I love the candied flowers. My mom used to make tiramisu all the time, it’s one of my favorite desserts. Thank you Ann, I’m glad that you like the tiramisu decorated with the candied flowers. Hi Mad Dog, I’m happy you like the tiramisu…it is delicious. Karen that is one special dessert made with love….it is my sister’s favorite! Thank you Donna, A lot of love did go into making this special dessert. What a lovely way to celebrate your 2 year anniversary! I was wondering what you were going to do with those gorgeous little candied flowers. Beautiful! Hi Karen, I’m glad you liked how I used the candied flowers. I thought this was a nice way to celebrate this anniversary…thank you. Congratulations on your milestone. I haven’t had tiramisu in a long time but could envision the taste reading the recipe. I have had it several times but it never looked as beautiful as yours. You raise the bar constantly for all of us who merely ‘cook.’ Thanks for doing that. Thank you Judy, for your wish and very kind words. I wanted to make a special dessert that I knew everyone would enjoy as a “thank you”. Karen, you remind me when I was having this in Florence. The candied flowers are a perfect match for it. Hi Danny, I glad that the tiramisu reminded you of your visit to Florence…such a wonderful city to explore. I’m glad you like how I used the candied flowers. They are sweet and added a nice little crunch to the creamy dessert. Thank you Reg, for your nice compliment and wish. Many people feel comfortable using raw eggs in recipes but I chose to use a cooked version for my post. This is simply stunning. Congratulations on your anniversary! Today is my son’s birthday, and this would be perfect for our celebration. Thank you Lynda, for your lovely compliment and wish. I think tiramisu is perfect for a birthday…I’ve made it for my husband’s birthday and he and friends love the recipe. Wish you son a “Happy Birthday” for me…I hope he has a nice day. Thank you Kathy! I can’t believe that I have been blogging for two years. I’m happy that you enjoy my stories and I appreciate your comments. Oooo, so VERY yummy looking too!! Hi Dahlia, I’m glad you like the tiramisu…it is as good as it looks. Thank you Roger, This really is a delicious dessert…it is a light as a cloud. Tiramisu is definitely one of my favorites and I make it with marsala in the coffee mixture like you do, but add Grand Marnier to the mascarpone and also shave a little chocolate between layers. Yours is absolutely gorgeous with the candied flowers on it. Karen…a worthy tribute to your anniversary. 🙂 Happy Blogging Anniversary and I look forward to your next year of fun food and travels. Hi Betsy, I think tiramisu is probably one of the most loved desserts. Grand Marnier is delicious added to this dessert and chocolate between the layers just adds to the deliciousness. I’m happy that you have enjoyed following my adventures in cooking and traveling…thank you so much! Thank you for the shout out Tanya! Congratulations to you and thanks for sharing such a special dessert with your readers – What a beautiful dessert and I love the addition of the flowers. Looking forward to many more of your posts. Happy Anniversary to you!!!!!!!!!!!! Thank you Southern, for your nice wish and compliment. I thought the special tiramisu was a nice way to say “thank you” to all of my readers. Happy Anniversary Karen! You found the perfect way to use your candied flowers! Thank you Katerina, for your wish. I’m happy that you liked how I used the candied flowers…I think they made the dessert special. Tiramisu is a favourite and has been on my own repertoire since the 1970s! Your version is very pretty. Congratulations on your second year of blogging, well done you. Hi Lizzy, Tiramisu is such a delicious dessert…I’m glad you enjoy it as much as I do. The two years of blogging went by so fast. I’m happy that you are one of my readers…thank you. Thank you Lizzy, for your kind words. I’m happy to know that you enjoy by blog and have added me to your blog roll…I appreciate that very much! Oh how I love Tiramisu! It makes me very happy too 🙂 Happy Bloggiversary Karen! This is so yummy!!! I like the special touch you added with the candied flowers. And congrats to you Karen!!! Hi David, This really is an absolutely yummy dessert. It was fun adding the candied flowers for a special occasion…I’m glad you like it. Thank you for your nice compliment and wish. Hi Myriam, Thank you for your lovely wish and compliment. I remember the lovely tiramisu that I had while visiting in your area of Tuscany. You are right, it is different from what I make…my recipe is very light. My God, now we are talking the dessert of all desserts – not a big fan of it – and only because I have got so many bad ones. Have only eaten one great Tiramisu and it was my Canadian colleague that made it – it was made in heaven. This looks fantastic and I’m sure I could eat a big chunk of it all by myself – and a big GRATTIS to your 2 years of blogging. Hopefully I will have this lovely world to land it .. for another 2 year. Yours was like a piece of art … beautiful. Rudi, one of the best chef’s I ever met – what ever he did .. it came out fantastically. He’s been dead now for over 10 years and I still miss him badly at times. Most of the time the dessert is far too watery – or the alcohol is too overpowering. Happy 2nd anniversary! Congrats – you write a really classy and entertaining blog. I had no clue Tiramisu dated only from the 1970s! It’s a brilliant dessert, and one of my favorites. And your presentation is gorgeous! Thank you John, for your nice wish…the two years went by so quickly. I’m happy that you enjoy by blog and appreciate your kind words. Tiramisu is one of my favorite desserts and I wanted to make a special one as a “thank you” to all my readers. An extremely special dessert too. Especially with those amazing candied flowers. Thank you David, for your nice compliment. The candied flowers were fun to do and I think made the tiramisu a special dessert to “thank” all my readers. Oh my goodness! this is a keeper! (I just saw it mentioned by Chica Andaluza on the way here! Absolutely stunning…. Karen, congratulations on your anniversary! Tiramisù is hard to beat when it comes to delicious, special occasion desserts and I am not at all surprised that you would chose this lovely Italian dessert to celebrate “in style!. I appreciate your nice wish, Andrea. It really think that tiramisu is a dessert that everyone loves. Hi Dedy, I’m glad that you enjoyed the tiramisu decorated with the candied flowers. I know that the mascarpone can be hard to find…I wasn’t able to get it for a long time but now our market carries it. One of the most beautiful tiramisu I have ever seen, Karen. Such a beautiful and yummy dessert. I love the flowers, too. Happy Anniversary! Thank you Mary, for the nice wish and compliment. This really is a delicious dessert and I think the flowers dressed it up for a special occasion. Thank you for your wish Carol…we both had a bloggiversary this month. I really do appreciate your lovely compliment. Happy Anniversary Karen, and what a beautiful way to commemorate such a wonderful body of work. Tiramisu is really one of my all time favourite desserts and it’s so easy to eat — it’s light texture almost fools you into thinking it’s without calories — but then you make it only once in a while for a wonderful event, it’s worth every last bit. I have to admit that I have never had Tiramisu in Italy, sadly it’s not one of JTs favourites and I would never order a full dessert for fear of finishing it — I like a bite or two at most (OK, maybe three or four). The lady fingers look particularly light and airy, they must have been exquisite drenched in the dipping liquid. And the candied flowers certainly did not disappoint, this dessert is every bit as beautiful as the teasing post you did of the actual candied flowers! I’m sure glad you took a slice photo, often I am as interested in the inside of the dessert as the whole. Thank you for sharing your lovely recipes and your beautiful travels; congratulations again, I wish you many, many more wonderful years of blogging. Thank you so much Eva, for your lovely compliment and wish. I’m glad you enjoyed the post and how I used the candied flowers to dress up the tiramisu. I did want everyone to see the inside layers on the tiramisu…using a springform pan makes slicing and serving the dessert very easy. I’m looking forward to the next year and always appreciate your visits and comments. Gorgeous! I’ve never made Tiramisu but I have been thinking I should give it a try. Hi Lisa, Thank you for stopping by for a visit and your nice compliment and wish. Tiramisu is not only delicious, it is very easy to prepare as well. I think you should give it a try. Hi Boleyn, I’m happy to know that you enjoyed the tiramisu with the candied flowers. I always appreciate your visits and nice compliments…thank you. I’m sorry I didn’t have any more to say but I was just stunned by the whole thing. I love tiramisu and buy it at a good Italian bakery but it’s a fairly straightforward presentation, a large square with grated chocolate on top, not the unique creation you’ve presented. You are so sweet Boleyn…you are one of my most loyal readers and your comments are always appreciated. Thank you again for your lovely compliment. What a glorious dessert, I have never tried making candies flowers, they are so pretty! Looks amazing! Hi Jenna, Thank you for stopping by for a visit and your nice compliment. I’m happy to know that you like the tiramisu recipe. Candying flowers is very easy and a nice way to dress up a dessert for a special occasion. Happy Anniversary/ Felice Anniversario mio Amico! Grazie Mille, Tania. I appreciate your nice wish. Are you planning any trips with your family? Whatever you do, have a lovely summer. So pretty! And many happy returns. Thank you Michelle, I appreciate your nice wish and compliment. Fantastic Karen. The candied flowers are a stroke of genius. Thank you very much Conor, for your lovely compliment…it is very much appreciated! Love tiramisu and yours looks beautiful! I’m like you Kenley, I love tiramisu. I’m happy to know that you like my tiramisu recipe…thank you. Happy Blogiversary! Tiramisu, my favorite dessert. I love your candied flowers, so pretty! Thank you so much Celia, for your kind words. I always appreciate your visits and lovely compliments. Beautiful. It’s like a tiramisu charlotte. I love tiramisu and when I’m really in the mood, I’ll make my own ladyfingers. I also recently bought (by mistake) a “tiramisu” mascarpone- actually was pretty good- basically just coffee flavored. Looking forward to year 3… you always have great ideas, recipes and inspirations. Hi Wendy, You are right, my special tiramisu was put together like a charlotte. It makes a pretty presentation, especially for an individual serving. I have heard about the flavored mascarpone that you can buy now but I have not seen it in my market. I’ve enjoyed your friendship from the time you were living in Germany until now that you are back in the states. Thank you for your lovely compliment. Tiramisu is one of those dessert that completely blew my mind when I first tasted it. It´s like the perfect mix of coffee and sabayon and mascarpone and all things that are good. This looks fantastic Karen, and so perfect for a celebration! Happy 2 years my friend! Hi Paula, I think that anyone who has ever tried tiramisu has fallen in love with this dessert. Thank you for your lovely compliment and wish. Even though I’m not a dessert fan I’ve always loved tiramisu. Until now. Now I’m addicted to banana cake/bread! Wishing you a fabulous further two years, and many more, of blogging. I know I always look forward to your wonderfully distinctive blog title showing within Yahoo mail. Congratulations on your milestone and sincere thanks for your blog: you have provided not only recipes made different and special each and every time, but fantastic travel stories and lovely photos of your home and grounds . . . Am speechless at the beauty of your dessert – have never seen tiramisu presented thus! And, yes, I knew it came from out Venice-way but not that it was born such a short time again 🙂 ! Thank you for your wish, Charlie. It has only been two years since I started Back Road Journal…it has been so much fun and the time has passed so quickly. I’m glad that you like what I did what the flowers. I have always wanted to make this one of my very favorites! We actually had a funny story once we were out at a chain italian restaurant and I bit into my Tiramasui and there was a big piece of plastic in it I have no idea what it is but I wanted to share with you my story and tell you your photos are just lovely! Yay! Happy 2nd blogging anniversary! And I love tiramisu. I could eat it every week. This looks like such a lovely recipe. Thank you for sharing it with me! Thank you Monet, for your nice wish. I’m glad that you enjoyed the recipe…it is a very light and delicious dessert. Beautiful presentation, the candied flowers make such a lovely topping! Happy two years of blogging! Hi Laura, Thank you for your nice compliment and wish. I do think that the candied flowers made this tiramisu pretty. I’m glad you like it…thank you. Aw! Thank YOU, Karen, for being such an amazing cook, blogger, and blog visitor as well! Happy two year anniversary! I raise a glass of Veuve to you and wish you many more! The tiramisu looks delicious, especially with the candied flowers. Such a pretty touch. Tiramisu is one of my favorite desserts. It’s nice to see it here beautifully presented. Thank you Daisy, I really do appreciate your sweet compliment. Veuve is my favorite champagne…I’ll think of you when I have a glass. Happy anniversary, Karen! Thank you so much for this extraordinary virtual feast! This is the most beautiful tiramisù I have ever seen! One of my favourite desserts… I could have it every single day for the rest of my life. I also always use marsala, but no cream. Thank you for your nice wish, Sissi. I’m happy that you like my special tiramisu. A lot of people do use cream but it makes the dessert extra light. Happy two years of blogging! I love everything about your tiramisu. With your candied fresh flowers, it looks gorgeous. You are absolutely right, it is one of those desserts that you would remember when you had it first. Colorful, beautiful and a happy post! 😀 Fae. Oh my gosh that looks scrumptious. I’ll have to try this recipe. Tiramisu is one of my favorite desserts! Hi Elizabeth, I think this is a very light tiramisu…I hope you will enjoy it. Thank you for your nice compliment. What a nice thing to say, Raymund. I appreciate your nice compliment. Whoa…..! Beautiful, beautiful, beautiful Karen! What a lovely presentation and recipe for a special occasion or to make any day a special occasion! Thank you Teresa, for your lovely compliment. I thought decorating the tiramisu with the candied flowers did make it special…I’m glad you liked it. I’ll be right over! Beautiful. I can have my bag packed for a Summer in Maine too! 🙂 Safe trip and get settled in. You would like Maine. 🙂 We are looking forward to our time on the lake and our summer gardening. I have vacationed in Maine a couple of times–I would like to move there. We even looked at a few properties. Keeping it in mind for the future. No. 4 graduates in 2 years. Not much keeping us here after that (except the garden)! Thank you Carla, for your nice compliment. I’m glad you like the way I decorated the tiramisu. Love the flowers! Nice touch! Karen, many congratulations on your two year blog birthday. Your tiramisu looks SO inviting and pretty, I wish I could reach into the screen and grab that slice. Blog on! Thank you B, for your nice wish and compliment. It has been a fun two years and I’m looking forward to the coming year. Wish you lived nearby…we could enjoy a slice together. I love how you candied the flowers last post. They look so pretty on this dessert. I must learn to candy flowers sometime. Makes art of the dessert. Hi Donna, It is really easy to candy flowers…I hope you will give it a try as you are always surrounded by lovely flowers. Congratulations on your 2nd blogging anniversary! I enjoyed each and everyone of your posts and am looking forward to many more anniversaries. A most unique, creative and pretty presentation. Forget about the calories, a huge slice please. How did the candied dandelion flowers taste? Hi Richard, I have to agree with you that this is a decadently delicious dessert. It is so light…almost like eating a cloud. I had to laugh…dessert first is not a bad idea where tiramisu is concerned. 🙂 Thank you for your nice compliment. what a great 2 years you have had. I always enjoy visiting your blog. This tiramsu looks delicious and delightful and just beautiful! I’m happy that you have enjoyed my blog, Jessica…it has been a lot of fun these past two years. I wanted to make the tiramisu special and I’m glad that you like it. Thank you for your nice compliment. I absolutely love the edible flowers decoration. Hope you are having an enjoyable week my dear! Wow — that cake is simply gorgeous! The candied flowers on it are amazing. They make the whole thing sparkle. Thanks for sharing the recipe — adding this one to the list of “must makes”! Hi Jessamine, Thank you for stopping by for a visit and your nice compliment. I’m glad that you like the tiramisu and hope you will enjoy it. Hi Debra, I’m happy to hear that you like the tiramisu. It is an easy dessert to prepare…I hope you try making it sometime. Thank you for your compliment and wish! Liz and I have made plenty of versions of tiramisu before, but never one as decorative as this Karen. Beautiful! Thank you Jed, I appreciate your nice compliment. It was fun to decorate the tiramisu as a “thank you” to readers like yourself for always stopping by my blog. That looks absolutely superb! I love tiramisu but I’ve never seen one with candied flowers before, it’s beautiful. A very happy anniversary! Thank you Lorna, for your love compliment and wish. 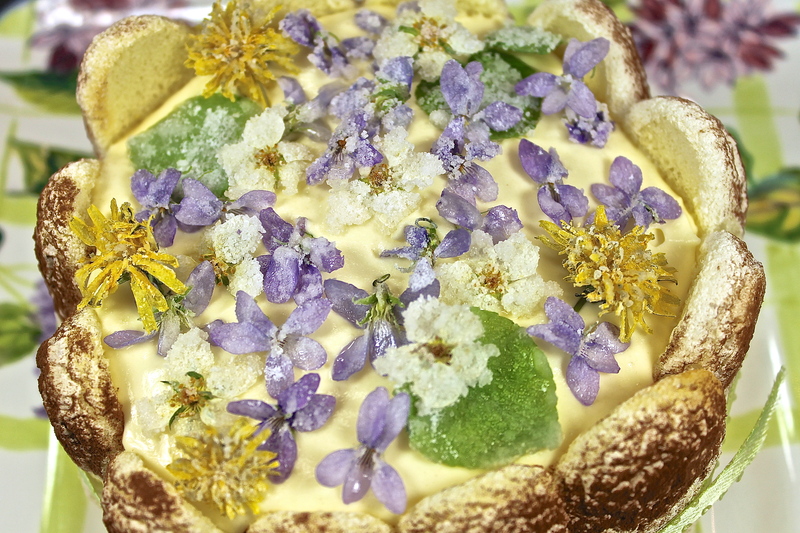 This may be the first tiramisu that has been decorated with candied flowers but I wanted to do something special for a “thank you” to my readers…I’m glad that you liked it. Wow – I’m drooling! So delicious. And congrats on your Bloggivesary. Hi Ladyfi, I’m really glad that you like the special tiramisu. Thank you for your nice compliment and wish. Thank you Barbara, for your nice wish…I can’t believe how fast the two years have gone by. I’m happy that you enjoyed the tiramisu. The candied wildflower topping was sweet and crunchy. Happy anniversary, Karen! Thank you for all you share – it really is a treat to stop by here. Your tiramisu is stunning and I love your addition of the pretty candied flowers. Thank you for your kind words, Hannah. I’m happy that you enjoy visiting my blog. 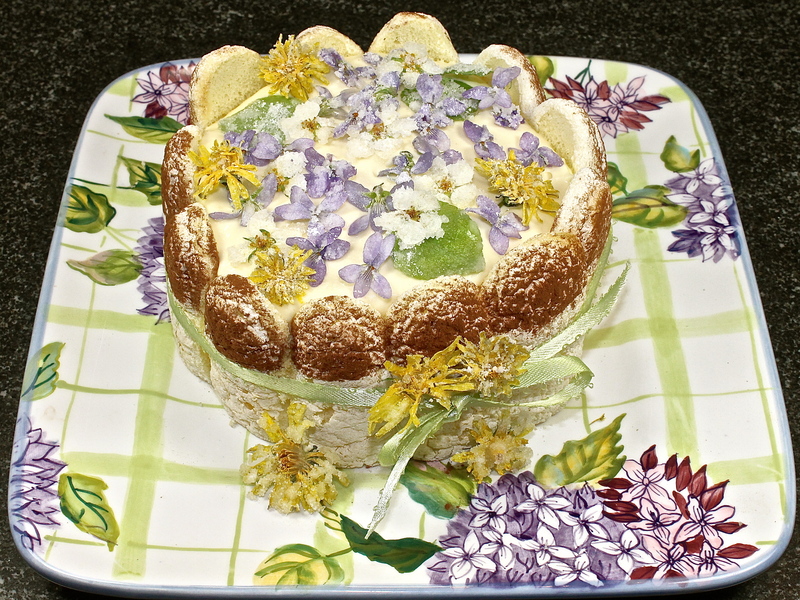 I liked the way the tiramisu turned out with the candied flowers…I’m glad you did as well. those candied flowers are just too precious! I love the idea of scattering them on the tiramisu, too! Hi Angela, I’m happy that you like the candied flowers…they were a fun project. I do think they made the tiramisu pretty. Thank you for your nice compliment. So pretty Karen! 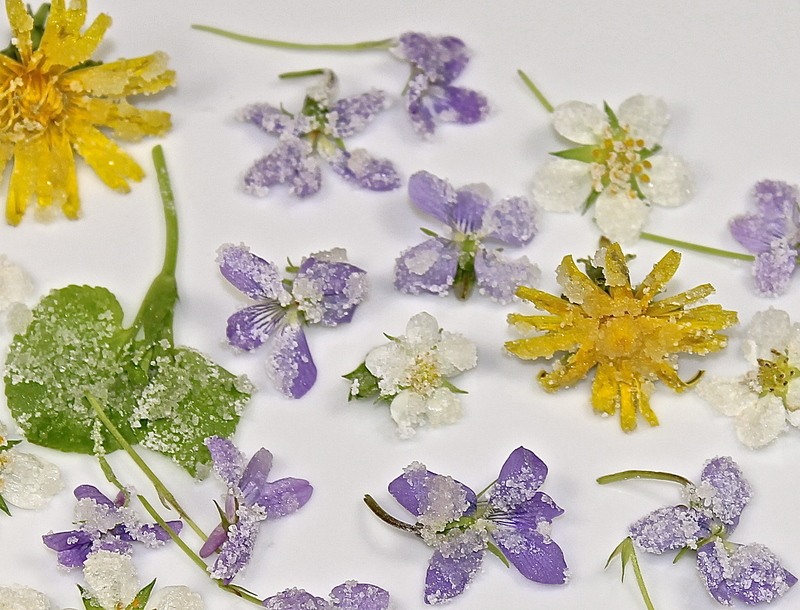 So that’s where you added those beautiful crystallized flowers! Beautiful! Hi Lidia, I’m glad that you liked what I did with the candied flowers. Thank you for your nice compliment. Congratulations on your anniversary. I think you’ve convinced me that I can make this dessert…not as pretty as yours, but the basics for sure. Thank you Jeannee, I’m happy that you enjoyed the candied flowers. 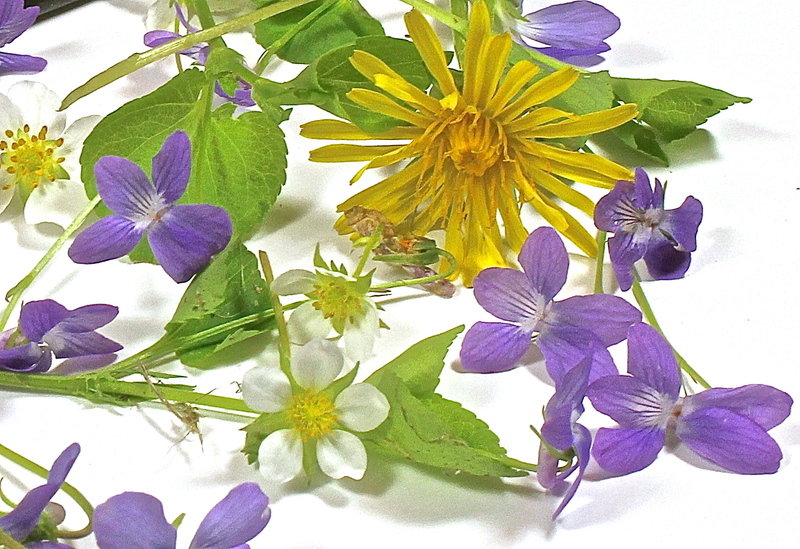 I thought it was fun to preserve the dainty spring wildflowers. Decorating the tiramisu with them was a sweet way of remembering what the orchard looks like in spring. I wanted to make a special dessert as a “thank you” and I think that this accomplished both. Thank you for your compliment and wish. Hi Krista, I’m happy to know that you like the candied flowers that I used to decorate the tiramisu…it was a fun project. Thank you for your nice compliment and wish. Happy Bloggiversary, Karen! It has been a joy following your blog these past two years! I am so glad I stumbled upon your lovely space. What a beautiful cake to celebrate with. It looks absolutely divine and I’m sure it tastes just as good as it looks. Thanks for all the time you have always taken to respond to everyone’s comments, comment on my posts and regularly post such wonderful things about your garden, food and personal travels. It has been a lot of fun to see these glimpses into your life. Thanks again! Thank you Laura, for your kind words. I’m very grateful to have such lovely readers as yourself…it is what makes blogging so enjoyable. This is just lovely, perfect for a special occasion like an anniversary, congratulations Karen! Congratulations and holy cow that tiramisu is gorgeous. Absolutely perfect. What a lot of work you went through. Well done! Thank you Maureen, for your lovely compliment and wish. I really did want to make something special for all my readers as a “thank you” for being such loyal readers…I’m glad you liked the tiramisu. I love tiramisu and had no idea it was such a relatively new dessert. Yours looks SO lovely! Hi Amy, It is interesting that such a popular dessert as tiramisu hasn’t been around all that long. I’m glad that you like my version. Happy Second Anniversary. What a wonderful dessert to celebrate with. The sugared flowers looks beautiful on top. Thank you Maria, for your nice compliment and wish. 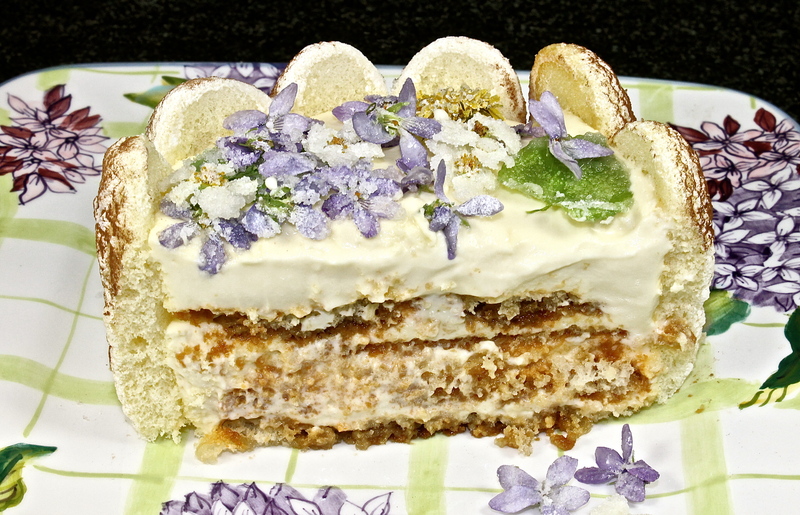 I do think the flowers gave the tiramisu a special look for the occasion…I’m glad you like it. Hi Meg, I’m glad that you liked the dessert. Thank you for your compliment and wish. Thank you so much Anne, for your nice compliment. I’m glad that you enjoyed the post. I never was a fan of Tiramisu until I tasted a good one and now I’m a huge fan! Yours looks delicious and like I said before, those flowers are amazing! Congratulations on your second year of blogging! Hi MJ, I can understand some people not caring for tiramisu when eating it out. Unfortunately there are a lot of bad versions served in restaurants. I’m glad that you like my version and thank you for your compliment and wish. Hi Rachel, You gave me a real laugh…hopefully you did not lick the screen. Thank you for your wish…I’m looking forward to this year of blogging. Happy anniversary, Karen! My oldest adores tiramisu and I’m going to have to make him your gorgeous recipe this summer. It’s a perfect celebratory cake. Thank you Liz, for your nice wish. I’m glad that you like the way I celebrated this anniversary. I hope you and your family will enjoy the recipe. the combination certainly got us all excited & salivating! Congratulations of the 2nd birthday of your blog. You do a lovely job here and I enjoy getting a slice of your life in the US. Even though I don’t like coffee, I really like Tiramisu. Your flowers are so pretty and lift what can be a simple looking dish. Oh my, but what a positively spectacular dessert creation. That must be the most gorgeous Tiramisu I have ever seen. Thanks for sharing. BRAVA! Grazie Adri, I’m very happy to know that you liked my version of tiramisu. Thank you for your very kind compliment. Congratulations on your second blog anniversary. 🙂 I just published my second anniversary post – it’s amazing to think I’ve been blogging for two years! The tiramisu looks lovely. I am a big fan of tiramisu! And I like your idea of adding candied flowers to make it look extra-special. Thank you Grace for your nice wish…it is amazing how fast two years goes by when you are having fun. I’m glad you liked how I decorated the tiramisu. My favourite, favourite dessert – and yours looks stunning! Must try it! Thank you Keith, for your nice compliment. I hope you will enjoy my version. Hi Azmina, Thank you for stopping by for a visit and your very kind compliment…it is much appreciated. The tiramisu was delicious…light as a cloud. Definitely the prettiest Tiramisu I have ever seen. Happy 2 year anniversary with your blog, Karen! You just made me realize my 2 years is coming up as well. Time goes by fast when you are having fun! Your story made me think about when I had my first Tiramisu (one of my favorite desserts) although I don’t think my story is as romantic as yours…I think it was Olive Garden – LOL! Happy anniversary, Karen. Your beautiful little flowers transformed Tiramisu into a very special dish. I don’t believe I have ever made this dessert at home. I must correct that. Thank you Anneli, for your nice compliment. The tiramisu was as good as it looks. Hi Afra, I’m like you when it comes to desserts. I think you would enjoy this version of tiramisu…it is so light. Thank you for your nice compliment. This looks too beautiful to eat, Karen. Thanks so much for the recipe, and congrats on your two years of blogging. Thank you Sylvia, for your lovely compliment. I do think the tiramisu turned out pretty but I’m happy we ate it…it was delicious. I’m glad you have enjoyed my posts…thank you for following along. Thank you Kiran, for your nice compliment and wish…I appreciate it. Oh my that looks so good. Happy Anniversary to your blog. Thank you Samokan, for your nice compliment and wish. Your Tiramisu looks wonderful! I have not yet attempted to make it at home, but it is on my bucket list of things to do! The delicate candied flowers really dress us the dessert! Thank you Laila, for your nice compliment. This is such a light and delicious version of tirmisu…I think you would enjoy it. Karen show stopping my friend!! Truly elegant and delicious!! I am sharing on my FB page!! Beautiful– love the sugared flowers– could use them on so many different desserts. Thanks for the recipe!! Thank you Rhonda, I’m happy that you enjoyed the post. You are right, the sugared flowers would look so pretty on many desserts. Your tiramisu presentation is very beautiful & just like a piece of real edible art, Karen! Thank you for your lovely wish and compliment, Sawsan. I’m very happy to know that you have enjoyed following along on my adventures…be it travels or food. The candied flowers did make a pretty topping for the tiramisu, I’m glad you like them. omg, this looks so good… gorgeous photos. love tiramisu. Edible flower has been so popular on food blogs, but this is my first time seeing “candied” flowers! What a unique and delicious idea! Love your tiramisu… one of favorite desserts ever! Thank you Nami, for your nice compliment. I’m happy to know that you like my tiramisu with the candied flowers. This was a light and delicious version of the dessert. I thought the candied flowers made the dessert special and a nice “thank you” to readers like yourself that always stop by. Congratulations on 2 years of blogging! Terrific job! Love the tiramisu recipe. I love the dessert, and it’s one I’ve always wanted to make, but never got around to doing. I love that you used your edible candied flowers to top the tiramisu! Thank you Ducky, for your nice wish…the two years went by so fast. The tiramisu was not only delicious, it was easy to prepare too.